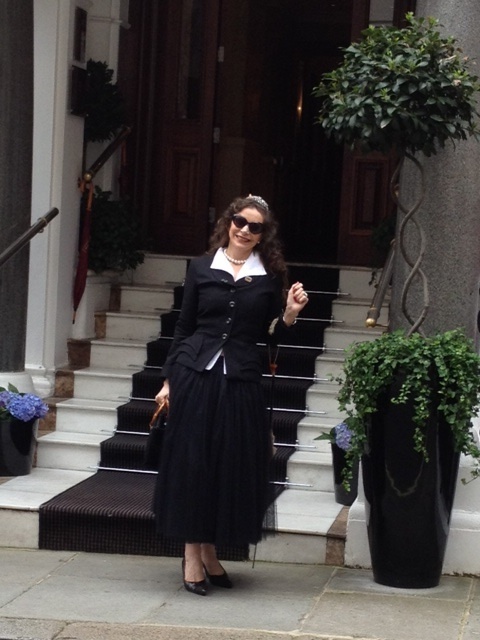 Bestselling author and Holiday Goddess Handbag Guide contributor Tyne O’Connell finds Dandy Land in London and strikes a pose. Pictures: Tyne O’Connell, Cordelia O’Connell. In the words of Shakespeare, “Apparel oft proclaim the man” but girls don’t need a man to tell us what we have long known: that we live and die before a mirror. Baudelaire defined a dandy/dandizette (f) as “one who elevates aesthetics to a living religion”. He considered the Dandies’ very existence a reproach against the middle classes. While some take up arms to fight their cause, the English prefer to take up their cravats. The bohemian youth of France were inspired by the English dandy, Beau Brummel to use their mode of dress to express their contempt for the bourgeoisie. Using apparel as a political protest has traditionally been an English trend. Byron and Wilde both epitomise the dandy principles but the Dandy lives and breathes in every chap or chappess who has ever dared to cut a swathe through homogeneity. If you choose individuality over egalitarianism, St James is your spiritual home and Beau Brummell your leader. St James’s is the historic area of London that runs between St James’s Palace and Piccadilly and is hemmed by Theatre Land and Green Park. It is where the expression “I like the cut of your jib” is still the ultimate compliment, embodying as it does the approval not just of your dress but what your dress says about you. It is a world which has remained largely unchanged in over 300 years. Nowhere else in the world can you purchase a Rembrandt or an original Tracy Emin, quaff oysters, roll your own cigar, be fitted for a bespoke suit, taste the rarest cheese, attend a play, borrow a book, picnic by a palace and buy a duchess’s tiara or an antique rifle, all within a 50 yard radius. At one end of St James’s stands that Grand Dame of English Hotels imortalised by Noel Coward in his song, Putting on The Ritz. Afternoon tea in Palm Court remains the ultimate high tea experience and if you are guided by Tallulah Bankhead the perfect spot for a drop of champagne from your slipper. Further down Piccadilly, buried under a pile of Royal Warrants, Fortnum & Mason the Queen’s grocer are busily producing honey from the bees they keep on their roof. If you long to try ambrosia surely it comes from the exclusive nectar these bees gather in the gardens of St James’s. F&M pride themselves on having invented the Scotch Egg, but they were also the first grocer to stock baked beans and to offer delivery anywhere in the world. Since 1707 British explorers, soldiers, hikers and mountain climbers have feasted on their hampers while Queen Victoria sent their beef tea to Florence Nightingale. To this day the Fortnum’s hamper remains the staple of The Season. I often pick up a hamper to sustain me on my rambles through the area. 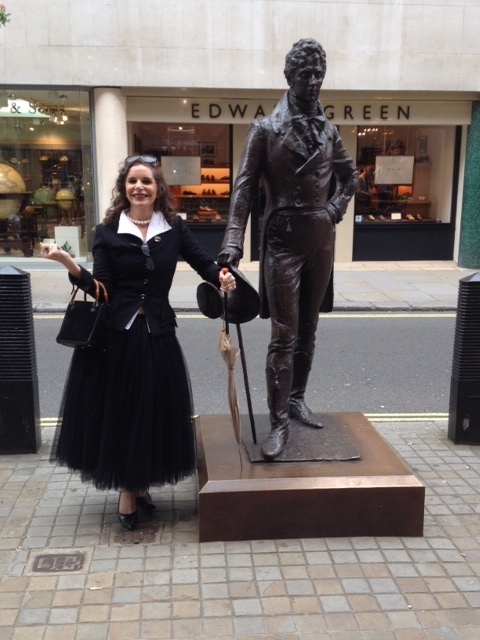 Once suitably “hampered”, exit Piccadilly through the Piccadilly Arcade at the end of which a statue of Beau Brummell – proudly plinth-ed and bronzed -welcomes you to Jermyn Street. Immortalized in literature, film and music, The Brummell was the iconic figure of Regency England who wisely recommended a gentleman polish his boots with champagne. Along with sartorial wisdom he is credited with establishing the modern gentleman’s suit, though it is doubtful he would find much to laud in the off-the-peg suits flapping about the male form today given it took him five hours to robe up of a morning; and that doesn’t include the time he spent fastening the pin to his cravat. Fashionable gentleman of the day, including the Prince Regent queued down the street to watch his fastidious and clearly fascinating toilet ritual. Like his great admirer Oscar Wilde, who used Beau’s persona as inspiration for Dorian Gray, Beau died in France heavily in debt to his tailor. Nonetheless he remains the iconic symbol of fine tailoring and those who dare to cut a line of their own against the modern obsession with egalitarian dress. To experience St James’s is to experience England as described in the pages of history by authors as various as Austen, Thackeray, Wodehouse, Mitford and Christie. It is the London that visitors from around the globe picture when they plan their tour of England; an area steeped in traditional and associated with refined style and leisurely activities pursued with nonchalant elegance. It has been the stomping ground of notable eccentrics both real and fictional from Lord Byron, Bertie Wooster, Nell Gwynn, James Bond, Oscar Wilde and the Duchess of Richmond. The later, famed for her refusal to become King Charles II’s mistress, was the original model for Britannia. It is a place where fact becomes fiction and fiction fact. Back in the 1660’s when London was really swinging, King Charles II asked his courtier Henry Jermyn to develop the area which was then residential, into a retail paradise. 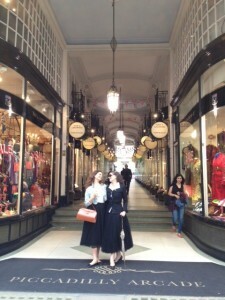 Since then, St James’s has been outfitting the aristocracy and gentlemen and ladies, of style. 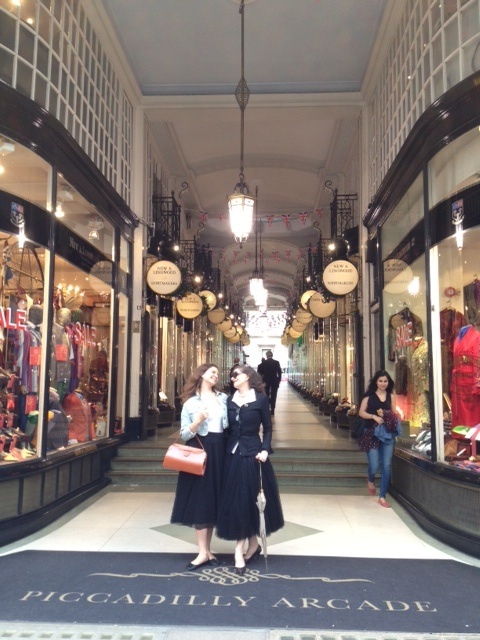 It is home to Britain’s oldest galleries, barbers, perfumers, book shops, tobacconists, cheese shops, wine merchants, tailors, hatters, book sellers and bench-made shoe makers, including John Lobb Bootmaker. Ian Fleming’s character James Bond wouldn’t walk a step without a pair of bespoke bench made John Lobbs which can easily run to over £8000 depending on your requirements. Across the road from John Lobb is Turnbull & Asser where James Bond had his shirts made. Should you aspire to Bond Style, they offer the James Bond cut of shirt. The street is famous for its royal warrant holders; particularly shirt makers. Traditionally everything sold here would have been handcrafted. These days, while most shops now sell mass produced items or supply larger brands such as Hermes, it is still the individual bespoke item in which they continue to specialise. St James is so much more than a destination in which to be suited and booted. It is in fact the place to experience bespoke, that particularly English experience that lies worlds beyond tailor-made. Bespoke is artistry and craftsmanship grafted to individual expression and distinguished by the client’s total and unquestioned control over fabric, cut and fit. That control includes the manner in which the item is made as well as the style. So if you want a shirt hand stitched along the contours of your body embroidered with gold thread with balloon sleeves and secret pockets in the collar to conceal your snuff, made of Irish linen or fine silk, this is where your every whim will be realised with exactitude by a Royal Warrant holder; all without raising a brow. However eccentric the rest of the world may find your demand for concealed snuff pockets, here you will be celebrated for your pernickityness. While wandering along Jermyn Street (though strictly speaking it is a street better suited to striding or prancing) take in the impressive architecture of Sir Christopher Wren at St James’s Church where William Blake was baptised. The church hosts regular concerts as well as a weekday bric-a-brac market. Further on Jermyn Street take in a show at the intimate Jermyn Street Theatre – which at 70 seats is the West End’s smallest – and a wonderful place to experience the work of young playwrights. Jermyn Street even boasts a nightclub – Tramps – the perfect spot for billionaires, rajas, oligarchs, sheiks and dandizettes to get their groove on. Should all the preening and posing prove too much, seek sanctuary in Wiltons where they have been serving the finest oysters and lobsters alongside an invigorating glass of champagne to chaps and chappesses since 1742. If you visit St James on a sunny day I’d suggest cracking open your Fortnum’s hamper on one of London’s best kept secret gardens. St James Square is one of London’s few private squares open to the public from 9-4 weekdays. You could pick up a bottle of fizz from St James’s own take on the off-license; Berry Bros & Rudd on St James’s Street. They have been supplying the nobles of the town with wine since 1698. The gossip on the street is Lord Byron died without paying his bill. They have their own label champagne or if you’re a lady of more scarlet tastes you could stick with the tried and true Chateau Neuf Du Pape. Never was picnicking so elegant. The square is presided over by the London Library, the worlds oldest lending library. Founded by a group of literary enthusiasts including Thomas Carlyle, Gladstone, George Elliot and Thackeray who, fed up with the pettiness of the British Library, cut a line to St James’s. For a mere £15 you can take out day membership amongst present day literary and academic notables and enjoy one of the finest collections of literature in the world dating back to the 16th Century. Finally, when it is time to enjoy the boon of sleep and rest your comely head, ensconce yourself in the pink turreted towers of the St James Hotel & Club off St James Street where you can enjoy unfussy old world English elegance with the luxurious high feather bed comforts and attention to detail that the dandizette demands. The artworks are all original by various German artists between the wars from the Rubinstein collection – think Christopher Isherwood and Cabaret. I shared the lift with Liza Minnelli last time I was there which was so apt. But do take care with the cocktails; they quite literally make your diamonds pop out. I lost a five-carat diamond there one languid Sunday afternoon but thanks to the convivial Blitz-like camaraderie of staff and patrons crawling about on hands and knees, the errant diamond was found and popped right back in without fuss. Events of mayhem borne with stylish insouciance are known as “doing a St James”. Do one sooner rather than later.